Performax Labs OxyMax the all-in-one thermogenic powerhouse. This precision formula of clinically researched ingredients at efficacious doses combines the best adrenaline boosters, metabolism enhancers, and appetite suppressors for all-day clean energy with minimal hunger or cravings. Caffeine is the most commonly used stimulant in the world. Its effectiveness doesn’t stop at adrenaline and focus – it increases calorie burning and fat burning, while also improving power output, aerobic, and anaerobic exercise. More calories burned means more weight lost. Astrup et al. (1990) demonstrated that caffeine can increase metabolic rate (calorie burn) by 32.4 kcal/hr, and increased fat burning. B-phenylethylamine is a trace amine that affects multiple neurotransmitters to improve energy, focus and mood, including catecholamines such as adrenaline and noradrenaline. These arousal hormones will cause increases in caloric expenditure, leading to weight loss. Borowsky et al. (2001) showed that trace amine receptors can be found in specific brain areas where B-phenylethylamine has demonstrated catecholaminergic activity. A meta-analysis (Stohs et al., 2012) reports multiple studies that indicate that trace amines can increase metabolic rate, fat burning, and energy expenditure. Hordeum vulgare is a naturally-occurring source of hordenine, an adrenergic-like compound that improves energy and focus. Through its action as a noradrenaline reuptake inhibitor, it enhances the bioavailability, action, and long-lasting effect of noradrenaline, an arousal hormone that can lead to caloric expenditure and weight loss. Rossato (2011) investigates how the activity of supplements on adrenergic receptors can elicit thermogenic (calorie burning) effects via stimulation of noradrenaline. Grains of paradise (Afromamum melegueta) is a commonly used spice in certain parts of the world. It shares some chemical similarities to Ginger, and its main active constituent, 6-paradol, has demonstrated weight loss benefits via increased caloric expenditure. Sugita et al. (2013) observed that supplementation with grains of paradise increased caloric burn through activation of brown adipose tissue, a type of fat tissue that encourages fat burning through heat production. Also known as sacred lotus, this plant can benefit weight loss in a number of ways, such as reduced fat accumulation in cells and reduced appetite. Its main constituent, Higenamine, is a known Beta-adrenergic agonist, similar to ephedrine. Siegner et al. (2010) observed potent lipolytic activity with lotus administration, which leads to less fat in tissues and more available for burning. Du et al. (2010) showed that lotus leaf extract leads to appetite reductions of 20-29%. Higenamine is demonstrated to be an effective agonist of beta-adrenergic receptors in a range of tissues, a mechanism similar to other fat burners ephedrine and synephrine. An important botanical in Ayurvedic medicine, Coleus forskohlii is known for its fat-burning effects, as well as improving overall body composition. In a study of 30 men, Godard et al. (2005) observed that lean mass and bone mass increased while fat mass decreased after Coleus foskohlii supplementation. Jagtap et al. (2011) showed that coleus can improve body mass index (BMI) while increasing high-density lipoprotein – the good cholesterol. A pigment found in brown seaweed, fucoxanthin is a fat-soluble compound that is stored in adipose tissue and inhibits fat cell growth and differentiation. Sixteen weeks of supplementation with fucoxanthin resulted in body weight loss of 12.1 pounds in the treatment group, along with increased metabolic rate and lower fat in the blood (Abidov, 2009). Piperine inhibits cytochrome P450 enzymes, which play essential roles in the elimination of many compounds. Therefore, piperine can increase the time that certain compounds stay in the bloodstream, thereby improving their effectiveness. Piperine has demonstrated increased bioavailability of bioactive compounds of up to 2000%. Other Ingredients: Gelatin, Silicon Dioxide, Magnesium Sterate. Q: How do I take Performax Labs’ OxyMax? A: Take one serving (one capsule) daily in the morning. 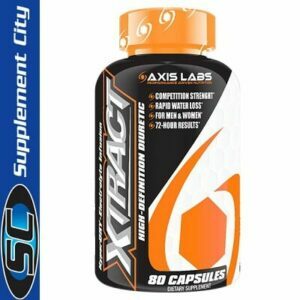 Q: What other Performax Labs’ products can I stack with OxyMax? A: Check out our Cut stack which combines OxyMax with SlinMax, HyperMax, and VasoMax for optimized hormonal regulation and performance in the gym. Q: Are trace amines safe? A: Though chemically similar to some dangerous drugs, the trace amines used in this formula – Eria jarensis and B-phenylethylamine HCl – are very safe. Due to their specific chemical structures, these compounds act similarly to other neurotransmitter activators, but without the side effects or dangers. 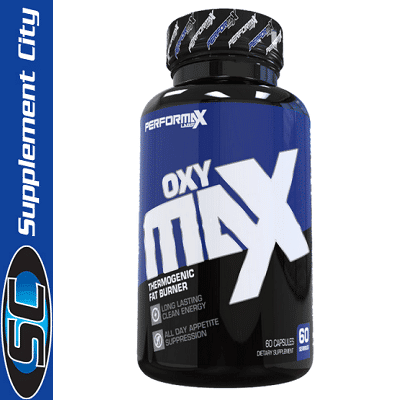 Q: When is the best time to take Performax Labs’ OxyMax? A: In the morning is best to set metabolism for the day and so htat the stimulants don’t disrupt sleep patterns. Preferably take OxyMax on an empty stomach, but utilize appropriately within the confines of your diet.